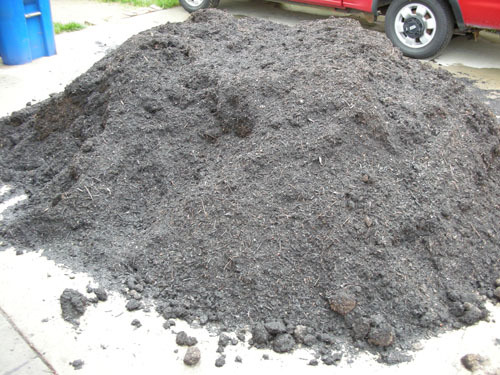 As a neighbor remarked to me on Friday, you can tell it's spring when the giant pile of compost appears in our driveway. I spent some time Friday putting compost on the roses, interrupted by the need to do things like run some errands and go to a doctor's appointment. 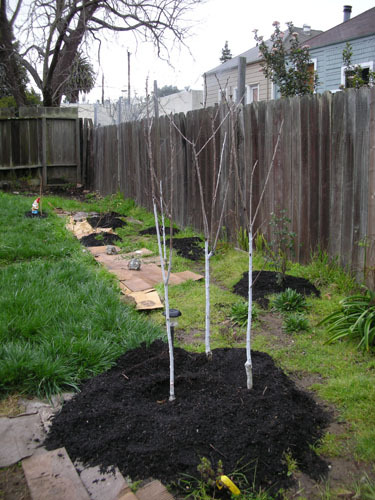 Saturday morning I worked more on spreading compost around the fruit trees and other plantings. 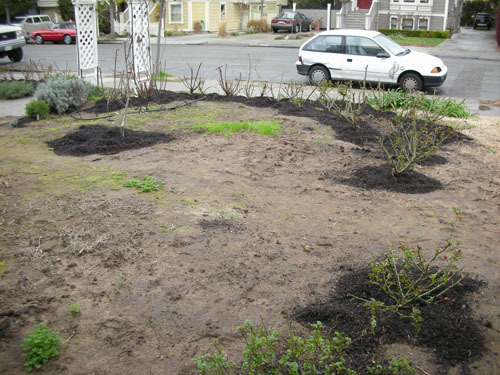 My theory for heavy-feeding plants is that giving them a huge pile of compost every year is the easiest way to make sure the soil around them stays full of nutrients and maintains a good structure. Also, it's much easier than keeping up rigourous schedules of fertilizing and tilling and all that stuff. I'm starting a bunch of food plants from seeds this year, so I needed to make a place for some of these things to go. 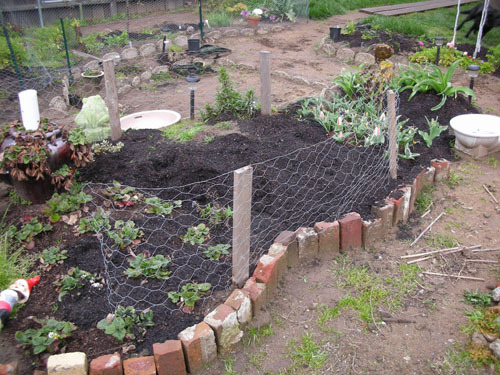 This new area next to the strawberry bed works well, filled up with compost. I think I'll put a couple of tomatoes here. 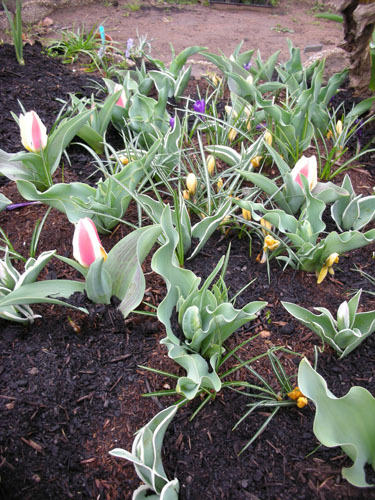 As you can see, my little patch of tulips and crocus are doing quite well. When it's not actually raining (as it was when I took this photo), the tulips open up wide. 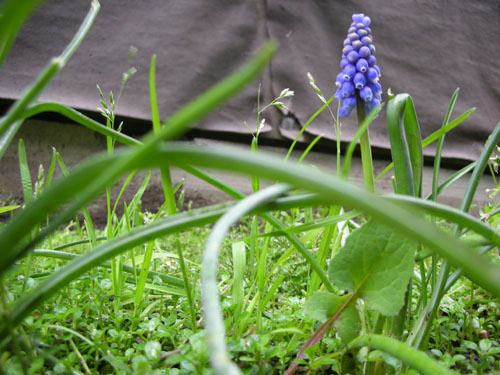 In the Fern Walk, the grape hyacinths are starting to bloom. These are supposed to naturalize around here, but we will see. Please ignore the large quantity of weeds there; I need to haul the flame weeder in there for a little Judgement Day action. 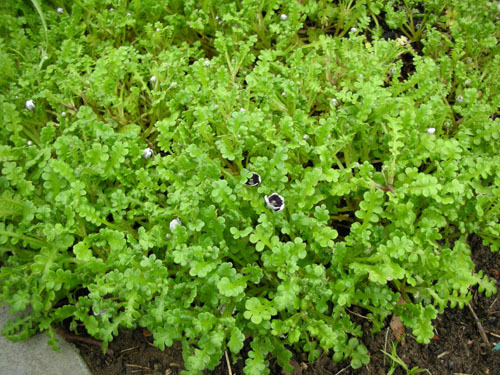 Here's a fun little plant, very easy to grow and enjoy forever: Nemophila menziesii 'Pennie Black'. I planted one of these last year and it self-sowed into a nice large patch this year. It's starting to bloom now but will really break out in another month or so. 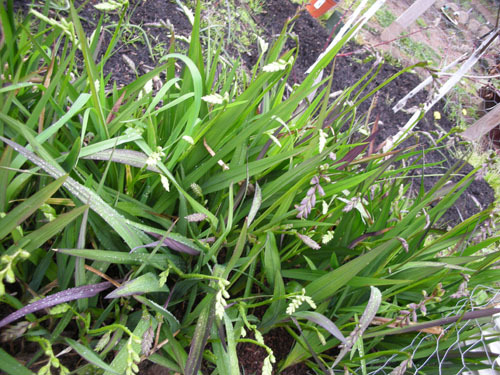 Also budding up for some fun are the freesias. I planted these in a huge random patch at the edge of the dahlia bed, and I'm not sure that was the most graceful place to put them. I think I might dig some up and spread them around a bit more once they go dormant. These are multi-coloured, not just plain white. And lastly, my other garden work, mostly Sunday after wearing myself out on the flame weeder. Still pulling out sod for the cold frame. It's hard to do this work when the soil is wet, so it's been slow going. And the sand in there is loaded with rocks, so I need to dig it out and sift it. 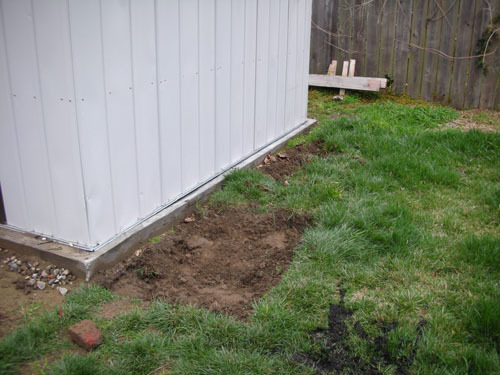 I've been laying the pieces of sod to the side where they could grow on their own, but when it comes down to it, I don't want that much grass in the garden, and I think I may be ready to just compost the stuff instead of trying to move it around more. The big plans for next weekend are finishing removing this sod, spreading more of the compost around, doing a fair amount of digging and sifting out front to plant the hydrangea (if it's not raining), and more flame weeding in the Fern Walk. It's the busy time of year in the garden. Hey-I was having fun surfing for old college pals and came across your site. It's nice to see you're doing well! I totally envy you right now with all the flowers already coming up. I'm in the mid-west now and we're still in the middle of snow and freezing rain around here-no flowers in sight! The garden/plants look like they have good bones and I love the colors! Happy Spring! Heh, when the piles o' compost start showing up around here, we joke that there's a plague going around turning cars into dirt. Big piles are SUVs, small ones little motorbikes. Your freesia sure look happy. They look a lot like crocosmia. Thanks for the info on Nemophilia menziesii, I've never seen that before.